Seven-year-old Mayra Gillis met her inspiration, Winter the Dolphin, featured in the movies "Dolphin Tale" and "Dolphin Tale 2," at Clearwater Marine Aquarium (CMA) on July 23. Read about Winter's story at SeeWinter.com. 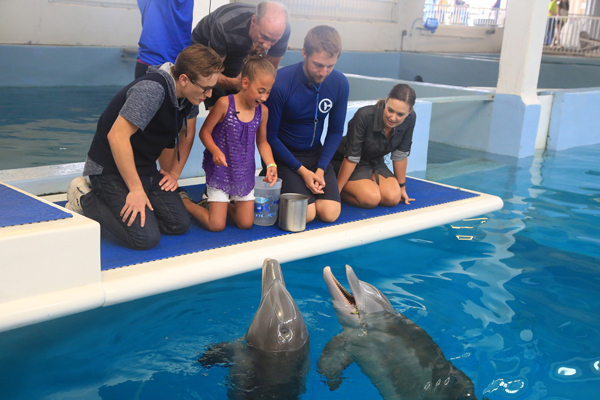 Movie stars Nathan Gamble, who plays Sawyer in the movies, and Austin Highsmith, who plays Phoebe, Winter's Animal Care Provider, surprised Mayra during her encounter with the dolphins Winter and Hope at CMA. Mayra had a brain bleed when she was just two days old which has affected her mobility and fine gross motor skills. When Mayra watched the "Dolphin Tale" movies it inspired her to work harder on her mobility, wear her day leg braces and her night time casts. When Mayra saw there is an animal that requires a prosthetic to be able to swim, it made her realize she isn't alone. "Millions of kids worldwide have had their lives positively impacted by the mantra of 'If Winter Can, I Can.'" David Yates CEO of Clearwater Marine Aquarium, said. "We were inspired by Myra's attitude of never giving up and happy she could meet Winter. " The actors who played Sawyer (Nathan Gamble), Hazel (Cozi Zuehlsdorff) and Phoebe (Austin Highsmith) in the "Dolphin Tale" movies will be at Clearwater Marine Aquarium from July 22-29 to meet with fans. View their appearance schedule here.